Advik Laboratories is in portfolio of Subramanian P. He is one of the top investors in India. It can be categorized as Penny stock based on current and past price performance. The company is not a well known company. It is one of the leading companies in field of Pain Relief Drugs & Medicines. The company has a dedicated website. But I was not able to access it while writing this article. The website was not working. This is bad sign for a Company. In modern time website is an identity of a company. I did not had good impression about it. 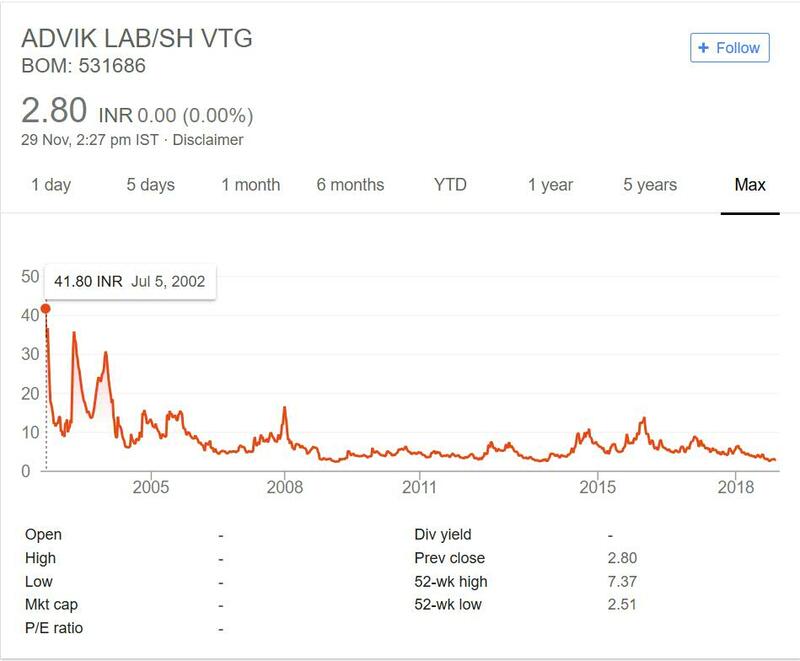 In year 2002 the company was trading at price point of 42. But in past 16 years it has not touched that price point again. The company has been on constant decline since then. It has not crossed 20 mark after 2004. During the recent bull run also the company under performed. The company is an old one. But it has not performed on exchanges nor it has grown much. Penny stocks have potential to become multi bagger. But Advik Laboratories is not that stock. It has not performed for over 16 years or so. Note this was golden period for Pharma stocks. You will find too many pharma stocks which have become multi baggers during this period but not this one. It has destroyed wealth in this period. Also the business vertical does not look promising as well. So I will not invest in such stock. I will recommend you to stay away from this counter even if eminent investor have put money in it. This is not a long term investment grade stock.